MUSINGS, MEANDERINGS AND MERRIMENT FROM ROSE: Mmmmmm! Quiche Lorraine! I had not made this dish in quite a while, but suddenly had a yearning to eat Quiche Lorraine. I hate to brag, but mine tastes far better than any I have tasted in restaurants. Maybe I am biased, though my father-in-law (of French descent) once said it was the best he had ever had, and hsi wife is French! It was heavenly! It will last me for 4 meals and I will savor each one. Doesn't it look scrumptious? It is so easy to make as well. I guess I will share my recipe with you! 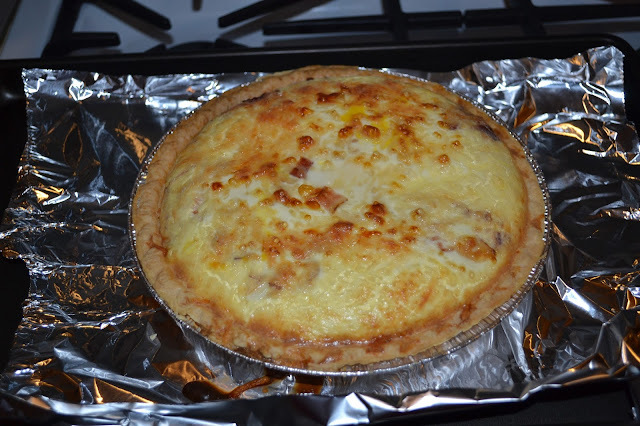 Sprinkle a layer of Swiss cheese, bacon (and onion if wanted) in pie shell; repeat till all in. Place on cookie sheet. In large mixing bowl, beat the eggs with a fork till blended. Then add the half-and-half, salt & pepper and blend well with fork. Slowly pour the mixture over the items in the pie crust using fork to move a bit to allow it all to soak in. Bake for 15 minutes at 425 degrees. Reduce heat to 300 degrees and bake for 30 minutes more or until toothpick inserted in center comes out clean. Cool to warm and gobble it up! You can substitute the bacon with 1 cup chopped up cooked chicken, or 1 cup chopped cooked ham or whatever you want to try! I love this and have not made it for quite some time either. I'll give your recipe a try. Thanks for sharing it, Rose. Hmmm, sounds like something my kid might actually eat! i'll give it a try! This sounds sooooo good Rose. I'm afraid my doctor would go after me with a stick! Looks awesome, it has made me hungry. When the t-shirt winked I had to get it! I was born in Kansas City, Mo. but was reborn when I moved to Oregon in February 1998. Oregon is peaceful, beautiful, green, lush and friendly. I have blossomed here. I love photography, writing poetry, reading, doing needlepoint, crafting, and spending time with friends. I am involved in a Women Writer's Group called Chrysalis and there is so much talent in this group. all copyrighted by Rose Lefebvre. Awesome Inc. theme. Powered by Blogger.